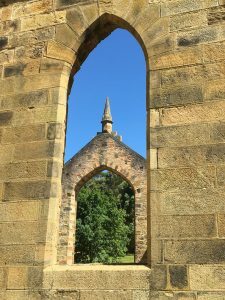 One of the biggest draw cards for us is Port Arthur, the site of one of Australia’s largest penal colonies. There’s so much to see and take in that your ticket lasts 2 days! 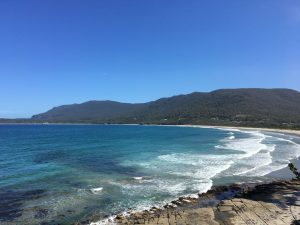 An easy 90 minute drive south-east from Hobart, you pass through a number small towns, through forest, bush and farmland. There are plenty of stops along the way for those who need to break up the drive. 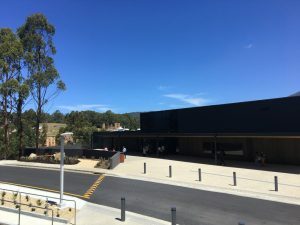 The Port Arthur visitor’s centre is a large, dark building with no identity – you can’t miss the building from the car park, however it’s not signposted in any way, not even where the entry is – there’s enough of a story behind the visitor’s centre to warrant the lack of identity. There are 2 parts to your entry ticket – an introductory tour and a harbour cruise. 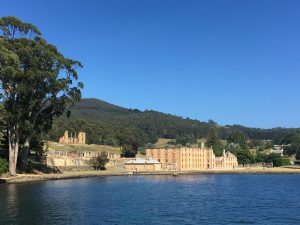 We took the harbour cruise first, learning about the origins of Port Arthur as a working port- fresh water, a deep harbour and lots of timber helped it become a boat-building location. The first part of the cruise took us past the site of the first Boy’s prison in the British Empire at Point Puer, as well as the Isle of the Dead where more than 1100 souls were laid to rest. After the 30 min harbour cruise, we paid our respects to those that lost their lives on April 28 1996 – wandering through a memorial setup to honour those that died in Australia’s worst mass-shooting in history. The site is respectful and quiet – not eerie, just a lovely, tranquil space to think and reflect on what happened more than 20 years ago. We wandered through the gardens, (recreated from soil analysis) where the children would play and ladies would relax and enjoy themselves, up to The Church (trivia – the church was never consecrated so services of any denomination could take place) and Government Cottage where visiting dignitaries would stay before joining a tour with tour guide Steve, who explained more about the workings of Port Arthur and its inhabitants over the next 45 minutes. After the tour, we went back to wandering amongst the buildings ourselves, continuing through the Hospital, Penitentiary, Pauper’s depot , the Separate Prison and the Asylum. 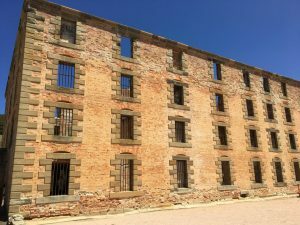 Even though Port Arthur’s history includes a combination of civilians, military personnel and convicts, it’s undeniably remembered for being one of Australia’s first and harshest jails. Overall we enjoyed our time at Port Arthur, trying to imagine how the place operated and was run is difficult in the modern age but they’ve done a great job to share the stories and keep the place running smoothly. If you’re thinking of going, budget the whole day or the better part of 4 hours or so. 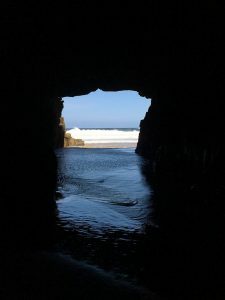 After Port Arthur, we went looking for caches, which took us through Carnarvon Bay, and onwards to Maingon Point, where we found Remarkable Cave. 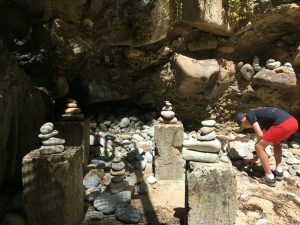 This cave is not far from the road down a few flights of stairs, and at the end you can see many examples of cairns (rock towers) – some on the ground, and others in more audacious spots on the cliff face on rock ledges and gaps in the walls. Next stop was at Eaglehawk Neck for fish & chips in a cone (watch the seagulls! 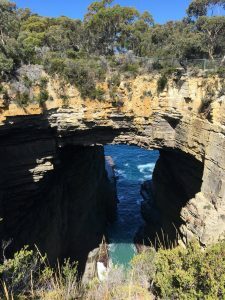 ), near the youngest-of-3 natural rock formations: The Blowhole (which made a lot of noise but no water-blowing action), it’s older uncle Tasmans Arch (doesn’t do much blow-holing as it’s a natural arch) and the elder of the 3, Devil’s Kitchen (which we didn’t visit). 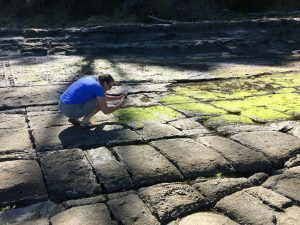 From here, it’s just a short drive to Pirates Bay and the famous Tessellated Pathway, created by nature, leaving a ‘pan’ or a ‘loaf’ in the stone – a pan occurs further from shore when the water dries quickly and leaves a layer of salt behind; a loaf occurs closer to the water where it stays under water for longer (with a shorter drying time) – the salt falls into the cracks and erodes the edges of the stone, thus forming the loaf-shape. 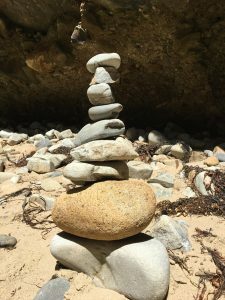 During low tide, the resulting stones look like a pathway . In the pic you can see Eva inspecting the pathway a little closer. At the end of our caching and sightseeing, we visited a friend who recently moved to Tasmania from Sydney to begin a motorcycle tour business before heading up another mountain (Mount Rumney) for the view and to find a cache.